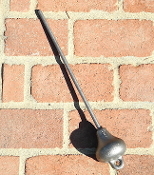 This is the clapper that comes with the larger bells that we sell on down to the Jesus Maria 1690. We we also make the clapper available to those that that need a clapper for their own old bell that is missing a clapper. We install by heating the top of the rod to ease in forming a closed eye which is placed through the eye inside of the top of the bell. If you can't heat it, you can always take it to a muffler shop to have it installed in you bell. The rod diameter is 3/8". The clapper has a cast hole to allow you to easily attach a rope.